Often people are nervous or intimidated about getting renovations or enhancing their property because of the work involved. SDP promises to tackle all the hard work for you, but here’s 10 things you should definitely know, or plan for, before you start your renovation. Often the first thing that clients should figure out, and the first thing that we need to know. If you have your budget figured out, everything else falls into that, and we can get to work with what we have. Don’t panic yourself into thinking you don’t have enough, we always try our best to work with budgets of all sizes. 2) What do you want to achieve with the renovation or extension? Are you wanting a walk in wardrobe, or a bathroom? An office or a new kitchen? Do you want more space for you and your family? Do you want to add value to your home so that you can move and upsize? Once you know what you want to achieve, we can draw up some ideas together, to figure out what would be best for your property and your needs. Developments to properties don’t happen overnight. It’s important that you recognise that these things can take time, and there can often be unforeseen circumstances to slow a build down. Decide on a good time window for you to be able to have builders in, that way, it’s stress free, and the builders can get on with their work, whilst you relax and watch your ideas be realised. 4) Do you need planning permission? 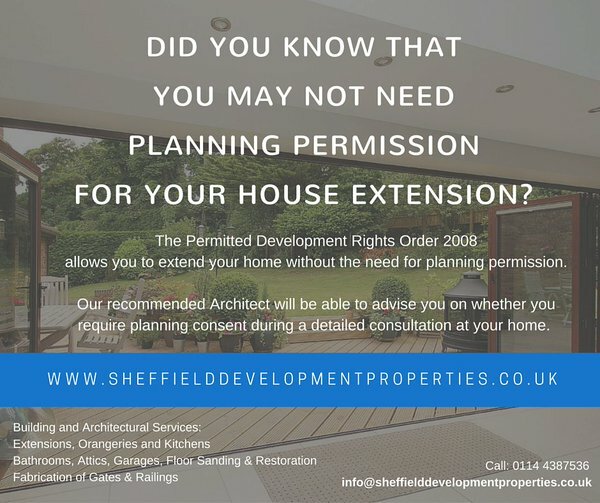 For some property alterations such as loft conversions and single storey extensions, or certain types of sun rooms, you may not need planning permission. You are well advised to check all local planning regulations and requirements first before making any definite plans to proceed. Check with your local planning officer for more information – or just ask your architect. 5) Do you need an architect? Call us biased, but we always advise consulting a professional. This takes a lot of stress away from you, and you can be rest assured that everything will be going by the book, and will be completed to a high, professional standard. 6) Will your plan impact on your neighbours? Be a good neighbour, and consider noise, and debris when arranging for a development or renovation. Whilst we will always clean up our mess, there may still be noise. Make sure that your neighbours are aware of your renovations, and maybe bake them a cake or take over a bottle of wine to keep them sweet! 7) Are you in a conservation area? You may not know if you’re in a conservation area, so check with the local Sheffield council – or use your architect’s knowledge. 8) Up or down? Left or Right? Where you put your house extension is the next decision, and it’s a very important one at that. Loft conversions are increasingly popular – so if you have the option of converting your attic space into a new room without any external signs of extending the property it’s definitely worth considering. Why not try down? We offer stylish basement conversions, adding a ‘secret room’ not visible to the outside world, for you to relax and unwind away from daily worries. You can consult an architect to see what is best for you, but no-one knows your needs like yourself. You should know where you want to build before starting a renovation. Make sure that you know and trust your builders. At SDP we have over 25 years experience in the property development and renovation field, so you know you can trust us. If that’s not enough, why not check out our testimonials page? See what other customers and clients have said about our work. As mentioned above, you should know that these things will take time. However, you should also figure out when is a good time for you. These things can often over-run, but picking the best time for you, when you can get everything sorted should something go wrong, can keep you from living on a construction site for months.